The BASTUO hammock tree strap is made of premium non-stretch nylon fabric, it support to 700lbs, every strap has 1 heavy duty nickel coated locking carabiners, ensure your hammock can hang safty. When you enjoy the outdoor activities, We suggest you use professional hammock straps. STURDY AND DURABLE STRUCTURE: Made of high density nylon fabric, ensure its durability under frequent use andswing,easy to make your hammock to attain the comfort height. 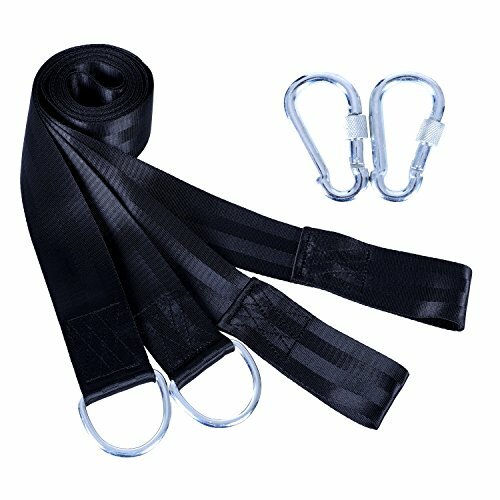 Each strap is 78.74" long, suitable for use in almost all outdoors environments, it's support up to 700LBS, enjoy your leisure time. LIGHTWEIGHT AND PORTABLE:There are 2 hammock tree hanging straps and 2 carabiners in the package. Its weight is only 1.1lbs, and can hang on your backpack. It's perfect for hiking, camping, it also fit swing in your yard. BE FRIENDLY TO THE TREES:The strap is 2inch width, it is parallel winding on the tree. So it will not damage the tree. You can use it safely, best for camping & hiking. EASY TO INSTALL:It's easy to install the hammock straps, no complicated structure, and there is also a installation drawing in the package. 100% MONEY BACK GUARANTEE:We make sure that every hammock strap is top line quality, If you aren't 100% satisified with the straps ,we will give a full refund to you. We hope create the best shopping experience for you. If you have any questions about this product by BASTUO, contact us by completing and submitting the form below. If you are looking for a specif part number, please include it with your message. WildHorn Outfitters LiteSpeed 11 ft. Hammock Tree Straps With Easy, Adjustable Cinch Buckle System, Climber-Rated Wiregate Carabiners Included, No More Loops. Strong, Lightweight, Pure Polyester.